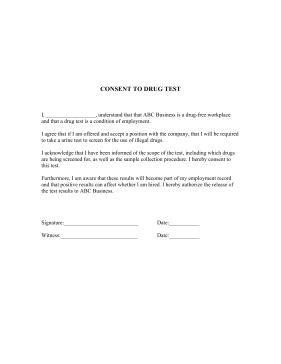 This form is to be presented to employees who are required to consent to a drug test as part of hiring or any drug-free workplace program. Includes authorization to release the results to the employer. I, __________________, understand that that ABC Business is a drug-free workplace and that a drug test is a condition of employment. I agree that if I am offered and accept a position with the company, that I will be required to take a urine test to screen for the use of illegal drugs. Furthermore, I am aware that these results will become part of my employment record and that positive results can affect whether I am hired. I hereby authorize the release of the test results to ABC Business.